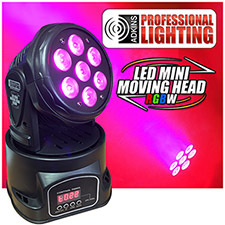 The Adkins Lighting Tri-Beam RGBA is a high quality, high power, intelligent, Wireless DMX Battery Powered LED Tri-Beam par fixture. This fixture can be used in standalone mode or connected in a Master/Slave configuration. 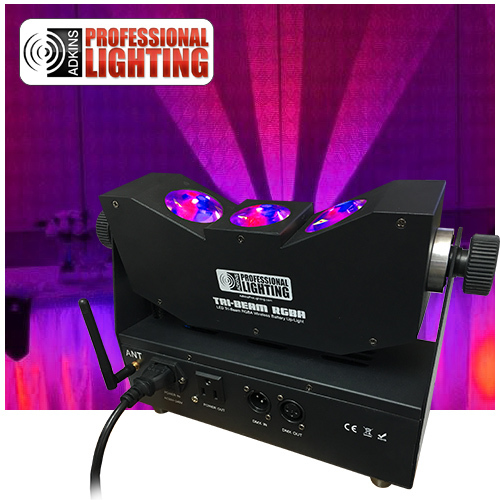 This fixture has five operating modes: Sound Active mode, Auto mode, RGBA mode and DMX control mode. 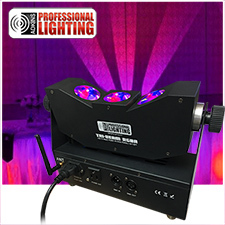 Control Channels: 7, 12 or 15 DMX Channels, Beam Angel: 15 degrees, LED Units: 3PCSx10W Cree LED (RGBA 4in1), Power consumption: 90W, Power Supply: AC 100-240V/50-60Hz, Packing size: 14.9in x 6.3in x 5.3in, Weight: 7.7lb(1pc/CTN), Recharge time: 4 hours, Battery working time: 5-16 hours.